Australia provides excellent infrastructure for getting around – one which accommodates all sorts of budgets. Whether it’s just you and your backpack on a shoestring, or whether you’re after a luxurious resort holiday, Australia has it all. At GIA, we specialise in bringing you no-nonsense, easy to book travel consultancy for all budgets and travel plans. Please enquire online to book a phone call with one of our consultants and discuss your travel options. We consult in English and German language. Australia boasts a wealth of varying landscapes, adventures and relaxation spots. Dive into the bustling nightlife of Sydney or enjoy with a quiet Outback tour in the Northern Territory! Whatever it is you seek, Australia will inspire you. Need help planning your travels? Simply ask us. Australia is well equipped with a great variety of transport options to suit every budget. One of the most popular options is to hire or purchase a car or camper van and hit the road independently. GIA can help you find a rental car, book a bus pass or hook up with other travellers online. There are plenty of backpacker car sales going on all around the country. You may even find what you are looking for on this website – just ask around in the forum! Accommodation options around Australia are plentiful and range from simple camping grounds to high-end resorts, depending on your budget. Find out what suits you best and let us know, we can help you get booked at very competitive rates. A few words about Australian wildlife. It’s what everyone wants to see while travelling the red country. And your chances of bumping into at least a few Kangaroos and Kookaburras are actually quite good! 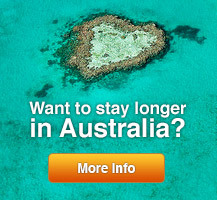 Click here for more information about Australian wildlife.